I started container gardening when we moved to our first apartment in Maine. We had a small balcony that got just enough sun for me to grow a few tomato and pepper plants on the railing. I enjoyed how clean and easy this was, no bugs to combat, no bending over. When we moved into a house, Rich built a raised bed and we had several gardens there. That was nice too but I still found it really convenient to grow our salad greens in planters on the front doorstep where I could just snip a salad without putting on my shoes. This is our first summer in the new house and while I had really hoped to put in a vegetable garden it just hasn’t happened. In hindsight it’s probably better that we didn’t as here we are approaching July and we’ve had about three days of sunshine. 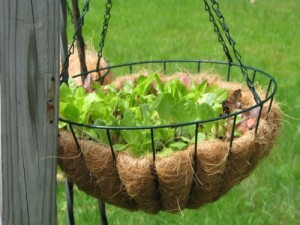 But I did start some salad greens in this hanging basket. I had the seeds and I had the basket and the hooks were still stuck in the ground where they got “planted” on moving day. I should have planted both baskets for a more frequent harvest, I still could given the cool weather here in Maine. But the rain-loving slugs and snails that have been eating everything on the ground haven’t bothered my salad greens at all! Salad greens don’t need a deep container and once the leaves are 3-4″ tall you can harvest once a week or so and they will continue to send up new leaves as long as it doesn’t get too hot. You can even move the baskets or planters around!